After watching Chicago Cubs first baseman, Anthony Rizzo catch the final out to end over 100 years of baseball futility in perhaps the most exciting World Series victory ever last October, I was reminded of a powerful symbol that marked my brief time at Douglas High School in the spring of 2007. 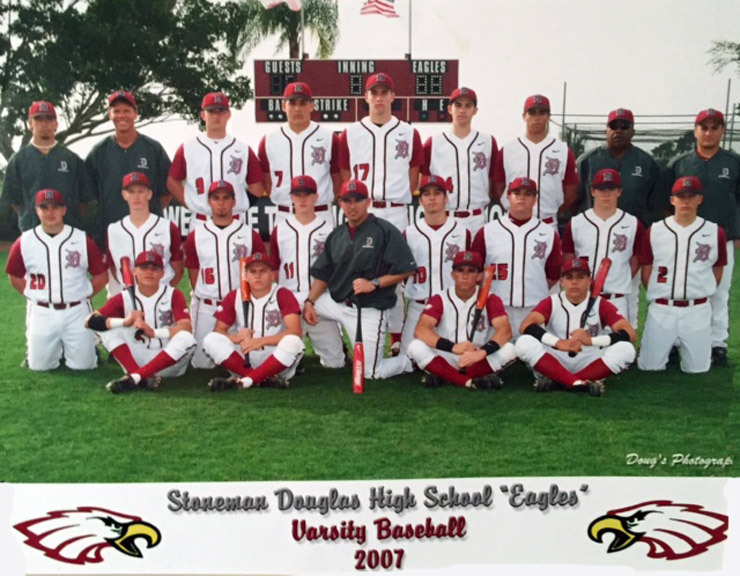 Marjory Stoneman Douglas High School in Parkland, Florida (a suburb of Fort Lauderdale) has a rich baseball tradition in Broward County with numerous district titles and a most recent national championship to its resume. But in 2007, Douglas was coming off a tough regional playoff loss the year before and my two stepping friend and head coach, Dean Florio was looking to fill the suddenly vacant pitching coach job. Dean and I spoke over the phone and when I went to visit him at the school we agreed that I would be the new Eagles pitching coordinator in between our country dance hall nights at the “Round Up”. Once on campus, I was immediately surprised by the quality and depth of talent at the school. Between the varsity, junior varsity and freshmen players that threw bullpens my first week at the school, I counted over 10 arms that were capable of above average ability. Consider, most high schools are fortunate to have 3 to 5 pitchers that are available to construct a competitive staff much like what I had three years prior at Deerfield Beach when we went to a regional final with two future MLB pitchers and three other players that could eat innings and compete. The only downside at Douglas, which really wasn’t much of one was the fact that only one of the ten pitchers was a lefty and a freshman at that. When the staff met to construct the varsity team for the spring I submitted the names I wanted on varsity, I was told that I did have a lefty that I hadn’t seen pitch yet that I could count on but he primarily was a first baseman and would be limited with his bullpen work. Thus, Anthony Rizzo would come and throw his pen with me once a week and devote the rest of his time to his craft at first base. Our bullpen area at Douglas was down the right field line and each day I would stop my work with the pitchers to watch Anthony take batting practice, in part because it was a truly impressive display of mechanical poetry and power that would send baseball lasers not only well beyond the 330 foot fence a few feet away but as a necessity in survival as a few of the stray missiles would sing close by our heads. After Anthony’s hitting clinic my pitchers would continue with their mechanic work while I mapped out mental exercises associated with the mound. And once a week Anthony would join us in the bullpen for a 20 pitch pen. As the season began, we started off a little shaky losing to perennial Florida and national powerhouse Flanagan High School before putting together a win streak that put us near the top of the county rankings. Looming ahead was a rematch with Flanagan, the now top rated baseball school in Florida at their home park. It was decided that Anthony would start on the hill and give us a big lefty to work against their talented hitters. Now, my daily custom as I mentioned was to create mental imagery that would challenge my pitchers to help them to succeed. Thus, as we came together in the bullpen a couple of days before the big game, I brought up the story of David and Goliath. The story of how a shepherd boy took on a giant and won has been the at the top of every underdog’s handbook, but my intent wasn’t to paint the image of our team as an underdog but to take a closer look at what leads to success. So, as I began I gave a brief background to the battle and the Biblical account where young David picks up stones from a brook and places them into his bag prior to his encounter with Goliath. And it’s there in the story that I placed my emphasis. “In the valley there’s a rock. The stones David found to use in his fight were located in a low area, a valley where a brook runs through it. And it’s in the low places that we reach down to find the weapons prepared for us to take into battle. When you’re dealing with high school kids, you never know if what you’re trying to apply really gets through, but my convictions have always led me to challenge them and to share my world view without reservation. And each step of my journey has been rewarded with the fruits of favor found in forged relationships with my students and players. In fact, most of my Facebook friends are former youngsters that I taught or coached and I still receive notes from them as reminders of our window together. The night of the game with Flanagan witnessed perfect conditions and as I settled into the bullpen to go over last minute instructions with Anthony I noticed a packed house with a lot of college and professional scouts in attendance. After he threw his final warm-up pitch we began our walk back toward the visitor dugout along the first base line. Suddenly, Anthony stopped reached down and picked up a rock before placing it into his back pocket. “I got my rock, Coach” is all he said as he smiled. Well, that night I witnessed one of the most dominant performances I’ve ever seen from a high school player, as Anthony totally shut down Flanagan on the mound and at the plate, as we mercy ruled them 13-1 and sent a message that we were giant killers. As the season wound down, we ultimately lost in the playoffs but several of our players were drafted in June including Anthony who was selected by Boston in the 6th round. Most people familiar with Anthony know that shortly after starting his professional career he was diagnosed with Hodgkin’s Lymphoma. His fight with this giant led him to a rock in the form of a pitcher by the name of John Lester who also had battled the disease and gave encouragement and friendship to Anthony and the Rizzo family. Before long, Anthony received the good news that he was healthy to resume baseball and thus began a remarkable climb to the majors. Additionally, from his battle was born The Anthony Rizzo Family Foundation in 2012, which has brought a new rock to many families fighting cancer through research and assistance. Although, I haven’t seen Anthony since our time at Douglas, I have followed each step of his journey and believe that his greatest ability in addition to being the best first baseman in Major League Baseball is his ability to share the weapons he has found in his valley. So, as I watched Anthony catch the final out of the World Series and noticed he had the presence of mind to slip the iconic baseball that represented so much to so many into his back pocket, I couldn’t help but see that ball as a rock that has defeated more than one giant. Here’s to wishing everyone a wonderful 2017 with the reminder that a rock is always close by. Great story. Not only did Anthony have great parents but some great coaches as well. Thanks for sharing!